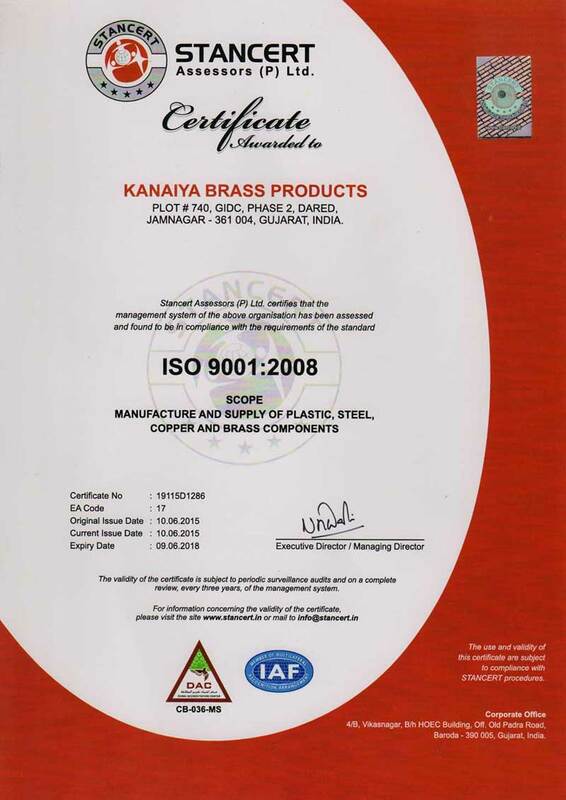 Kanaiya Brass Products was established in the year 1990 by a visionary Mr. Anil Kathiriya with few machineries and infrastructure with an aim to supply the growing demand in the field of LPG Cylinder Valve & Regulator. During the tenure of 20 years company has got good achievement in development of new items for various categories like ELECTRICAL, ELECTRONICS, LPG GAS COMPONENTS, PIPE FITTINGS, CPVC-PPR FITTINGS, PNUMATIC & INSTRUMENTS FITTINGS. our unit is well setup with the modern Machinery, Testing Equipment, Workshop, Manpower, Technical team to undertake quality job on mass production under one roof. Our customers need is the main motto of the company on which it is executing since 1990. The traditional relationship of pride of craftsman with is craft is combined with the speed and precision of modern machinery, to foster a new step of art and technology. we shall also strive for continuous improvement in our business. we shall periodically review our quality policy & Objectives for their continued stability.
" We predict our commitment as well hard work in order to succeed "